If you would like our to add your business to this page, please send information about the business to: austinaggiemoms@aggienetwork.com . Please include the business name, a 1 sentence blurb about the business, your contact information, and a link to your website. Below are some businesses run by Austin Area Aggie Moms. Debbie Rosenberg – Deb on Holiday! 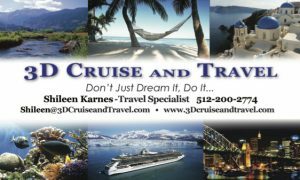 Let me help you take the stress out of travel planning by offering unique vacation packages with excellent customer service free of charge! If you don’t think photos are important, wait until they are all you have left.